led to his appointment as a member of the first State Board of Health, passed by the Iowa legislature on the 26th day of March, 1880, and approved by the governor on the 23rd day of April, 1880. Dr. Clark served on the board thirteen years. rode into McGregor just as the church bells were ringing for evening service. That was forty-six years ago (55 years). I have been there since with the exception of a couple of days now and then to attend a medical meeting or similar form of recreation. McGregor. There he soon became recognized as the surgeon not only for the town, but the surrounding country for miles, he was the only man thought of when a surgeon was required. took off his high silk hat which he always wore and in which he carried his letters, red bandanna, cigars, stethoscope and always either a clean or dirty collar, pulled off his coat, rolled his sleeve to his elbow and thrust his hand to the bottom of the spring. After lifting aside a few stones he pulled out a flask of whiskey. He uncorked it, took a generous drink and then returned the bottle to the bottom of the spring for future use. had a crippled hand and was my friend. The truth is that inasmuch as no one in my locality until very recent years gave anything like especial attention to surgery, the field was largely mine and so, while I claim no expert knowledge and have never posed as a surgeon, I have taken care of a large number of surgical cases and have sometimes been called a surgeon. I need not tell you that such is not now the case and later on may give you a hint as to the why and wherefore." 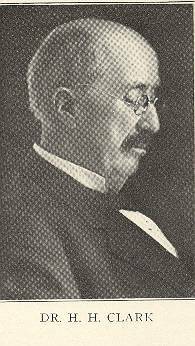 hospital, and, assisted by his daughter, Dr. Alice Clark Brooks, a creditable hospital was organized. Dr. Clark was a surgeon to the C.M.& St.P. Ry.Co. for fifty years, and when the C.M.&St.P. system surgical association was formed, he became an active member. The writer recalls numerous occasions when Dr. Clark, participated in the discussion of problems which were of particular interest to railway surgeons; he was always quite positive in his views, which he did not hesitate to express. In 1871 Dr. Clark and Miss Judith Baugh, daughter of Judge Downing Baugh, were married, and to them six children were born, four of whom, with Mrs. Clark, survive him. The Journal of the Iowa State Medical Society. This book has no date, I believe it was written between 1925 and 1930, but many of the 'Journal' articles in the book date much earlier. *See also, the biography of Dr. Frederick Andros on this biography board.